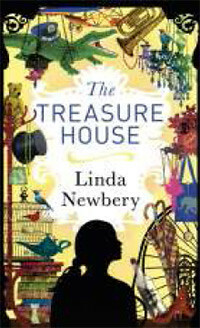 I am pleased today to welcome Linda Newbery, one of Britain's finest writers onto the blog today. Her new book, The Treasure House was published this week on the 3rd of May. You have been producing award winning books since 1988. With the experience you have now, do you find that the writing process gets easier with each book? Definitely not! If I started to find it easy, that would be the time to worry. Every new book has its own challenges – it ought to be difficult. Complacency doesn’t produce good writing. The Treasure House is due for publication with Orion Children’s Books this month, please can you tell us a little bit about it? I am rather intrigued by the setting of the book. What made you set a story in a charity shop? For a while I helped in a charity shop (sorting out the books!) and found it fascinating – the things that turn up, the possible stories behind them, items that get there by mistake, things that were once precious to someone – then there are the lucky finds, the clever person who sorts through the rails and puts clothes together to look chic and stylish, the one who comes in mainly to tell their life story, the volunteer who does little but gossip and make tea … there is so much material for stories! How could I resist? I can’t wait to hear more about the two eccentric aunts in the book, did you base them on anyone you know? No. I rarely base characters on real people. I liked the idea of these two great-aunts who are devoted to their shop and bring different qualities to the running of it - Aunt Nell brisk and businesslike, Aunt Rose soft-hearted and sympathetic. They’re often argumentative and huffy with each other, but beneath it, deeply affectionate, and they both love Nina. Nina’s Dad is their nephew, and they’re a bit disapproving of Mum, considering her flighty and unreliable. What kind of research did you need to do in order to write this book? There were bits and pieces. Llamas – monasteries – strokes – valuable chess-sets … those are some of the things I remember looking up. The setting, Crowdenbridge, is based on Hebden Bridge in Yorkshire, as anyone from that area will soon realise: there are names like Tiptonstall and Hattersfield in the story, and the Bronte Parsonage at Haworth within easy reach. I’ve been to Hebden Bridge several times when tutoring at Lumb Bank for the Arvon Foundation, and it’s a place I always enjoy visiting. I read that you find your day often gets filled with other things besides writing. Do you try to aim for a certain quota of words each day? I do have a kind of discipline, though it doesn’t look like it to anyone else. My husband thinks I spend my time drinking coffee, emailing friends, gardening and doing yoga. But there is a routine. First, and most important, is that I always write early in the morning, as soon as I wake up. That hour, or hour and a half, gets the day off to a positive start. I return to my writing several times, so on a good day I’ll write about 1,200 words. I can work much harder when revising – I love revising! Are you a plotter or a fly by the seat of your pants type of author? I never start with a complete plot, but more often with a setting (as I did here). Then characters, and the story grows from those elements. Patrick Ness recently said that he starts with an idea of the beginning, the end, and three great scenes. I recognise that exactly. I could never plan an entire book, because my mind doesn’t work as logically as that. The greatest part of the fun of writing is seeing what happens when you start off with good ingredients – there will be surprises, things that come out of the writing and the absorption in the story. I might do a bit of editing along the way – mainly because of not planning very thoroughly. This can mean that in the middle of chapter seven I realise that something needs to be planted back in chapter two. That sort of thing. And a good way to get going, or to get moving when stuck, is to read through yesterday’s work, which invariably means making some changes. I see from your website, you are a cat lover too. Do your beautiful cats take it in turns sitting on your lap while you write? No, no cats. I need to have my keyboard on my lap and my screen at eye-height. Anyway, the cats always want to walk on the keyboard and change things – it doesn’t really work. We have a visiting cat, Louis, who likes to make himself at home in my study – he is completely charming, but I don’t encourage it. Which authors inspired you while growing up? I wanted to be an author from the age of eight. There are many authors who have inspired me, and still do of course, but the one who started it was Monica Edwards. Her books aren’t around much nowadays, though they’re sought by collectors. She wrote two series, the Romney Marsh books and the Punchbowl Farm stories – forty-something in total. I read them all, and she definitely made me want to be an author. Also I think she influenced the kind of author I wanted to be – it was the sense of place, weather and seasons in her books that made me love them. An adult novel, a children’s novel for 9+, a book about writing for children – and I have a poetry idea to start when I have time. Think of yourself as a writer. Write every day, even if it’s only for a short time. Read. Read what you love but don’t study the market too closely. Write. Thank you Linda for taking the time to answer my questions. The Treasure House is on sale now from all major book shops. Fantastic insight into the working life of a wonderful writer. Thanks! Great interview, I love the sound of The Treasure House, will definitely be looking out for it. A story set in a charity shop? I'm intrigued. A great interview, it was interesting to read that Linda believes complacency doesn’t produce good writing. Wonderful interview! This author's words are inspirational. The book looks and sounds quite lovely.